Maputo — The arrest of journalist Amade Abubakar in the northern Mozambican province of Cabo Delgado shows that the bodies of the administration of justice still have no idea of how journalists work, declared the Mozambican chapter of the regional press freedom body MISA (Media Institute of Southern Africa) on Wednesday. After his illegal detention for 13 days in a military barracks in the town of Mueda, the Public Prosecutor's Office charged Abubacar with "violation of state secrets using a computer" and "public instigation to crime using a computer". The evidence for these charges is flimsy. The prosecution claims Abubakar had a list "including names of youths who operate with the so-called Al Shabaab" (the name commonly used for the terrorist group operating in the northern districts of Cabo Delgado). Supposedly Abubacar could not explain why he had this list. The attorneys in Abubacar's home district of Macomia thus seemed unaware that journalists collect information, including the names of possible sources. "This exercise is very normal for journalists working in democratic contexts", said MISA, "and so it is wrong to see this list, if it exists, as an act of espionage". The second piece of "evidence" against Abubakar was that he was undertaking journalistic work without the knowledge of his superior, at the Mass Communications Institute (ICS), the public body that owns the Nacadje Community Radio in Macomia, and where Abubacar has worked for the past nine years. MISA pointed out that good journalists do not ask permission from their superiors every time they come across an important story. In Abubacar's case, he was seized when he was photographing internally displaced people fleeing into Macomia town to escape from terrorist attacks in the interior of the district. Furthermore, Abubacar did not work solely for the community radio. He was a stringer for various other media, and published material on his own blog. 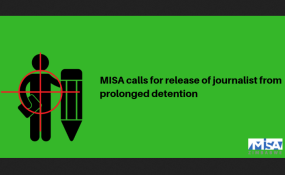 "A journalist guided by the highest professional standards is always active, and does not need authorisation from his newsroom to undertake journalistic activity", said MISA. "Whenever an event contains relevant news value, he collects the information and publishes it on the basis of professional criteria". Furthermore, MISA points out that the charges against Abubacar have been made on the basis of interrogation under illegal conditions. As the public prosecutor's office admits, he was grabbed off the streets without any arrest warrant, and was then kept incommunicado in the Mueda barracks for 13 days. Under Mozambican law, the longest a suspect can be kept in preventive detention before he is presented to a magistrate is 48 hours. During those 13 days, Abubacar was denied his right to a defence lawyer. Nobody knows exactly what happened in that time, and whether evidence against Abubacar was forged. MISA has hired a lawyer to represent Abubacar, but the lawyer lives in the provincial capital, Pemba, which is 226 kilometres from Macomia. So the lawyer has only seen Abubacar once, when he was presented to the Macomia court, last week, after he was returned from Mueda. The lawyer told MISA that Abubacar had complained that he was brutally beaten by soldiers in Mueda. But MISA has only been dealing with legal matters and could not answer questions about Abubacar's state of health. Efforts are currently under way to secure Abubacar's release on bail - though, given the illegal nature of his detention, there is a strong case for unconditional release and dropping all the charges. MISA argues that the detention of Abubacar is "unacceptable under the democratic rule of law", and violates the various international human rights conventions that Mozambique has signed. MISA also announced that it will attempt to identify and prosecute those responsible for Abubacar's ordeal.